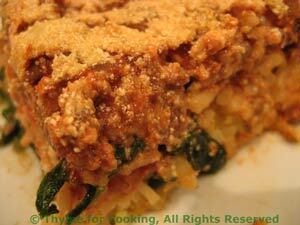 Spaghetti Pie, Thyme for Cooking recipes. Another retro dish, this was very popular in the late '70's. This has, as usual, been updated a bit - made healthier. I used less cheese and added spinach. This should use up the rest of the ricotta.